Corn is a source of many food products, including grits and cornmeal. Both come from maize, but they are just as different as they are similar! This article highlights how they are separate corn products. Grits are a Native American food made from boiled, ground corn. They are typically served mixed with other flavorings as a breakfast meal. Despite their origin, grits became popular among folks in the southern states and are now available all throughout the US. Restaurants in the South serve grits with shrimp as an evening entree. Although “hasty pudding” is made the same way (boiled ground maize), it is not to be confused with the coarsely ground grits. Grits are also very similar to other thick corn-based porridges from various countries all over the globe. The word “grits” is derived from “grytt,” which is an old English term for coarse meal. A third of all grits sold in the US are bought in the South, from an area that spans from Texas to Virginia and is called the “grits belt.” In 2002, grits were declared the official prepared food of the state of Georgia. Grits are typically eaten accompanied by a wide range of food such as bacon and eggs, country ham, salmon croquettes, fried catfish, and many more dishes. Solidified grits can be sliced and fried in vegetable oil, bacon grease, or butter. They can also be breaded using beaten eggs and bread crumbs prior to being fried. Grits come in yellow or white, depending on the color of the corn. “Quick grits” sold in supermarkets are the most common version. This variety has its germ and hull removed, while whole kernel grits are usually called stone ground grits. 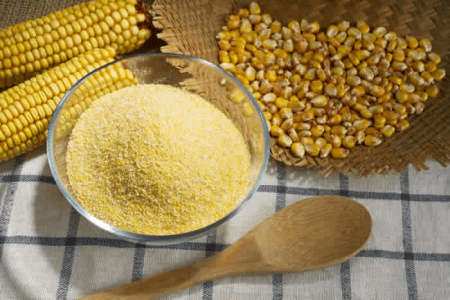 There are several types of cornmeal. Blue cornmeal is made of fine or medium ground dried corn kernels. It has a violet or light blue color and a sweet taste.There is steel-ground yellow cornmeal which is common in most US states. Stone-ground cornmeal is more flavorful and nutritious. It is more perishable but will have a longer shelf life if kept refrigerated. White cornmeal is from white corn and is well-known in some African territories. It is a popular ingredient for cornbread in the Southern states. So what is the difference between grits and cornmeal? Grits are made by grounding corn into a coarse meal which is boiled thereafter. Cornmeal, on the other hand, is ground dried corn. While grits are a coarse meal, cornmeal comes in finely ground, (i.e. corn flour) medium, and coarse ground varieties. 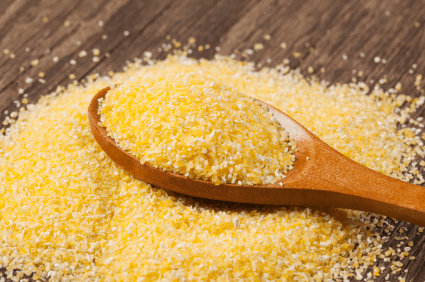 When boiled, ground corn becomes grit, but boiled cornmeal is known as polenta.